A Charlie Brown Christmas joins How the Grinch Stole Christmas and A Christmas Story on continuous loop in the Michaels family manse during the holiday season. The 1965 TV special remains a delight, even in this day and age—a near-perfect blend of music, message, and Charles M. Schulz's Peanuts gang. And if you don't feel the same, I'm pretty sure we can never be friends. If, however, you do hold the Charlie Brown Christmas special in high esteem, you're likely to enjoy its recently released iOS adaptation from Loud Crow Interactive. 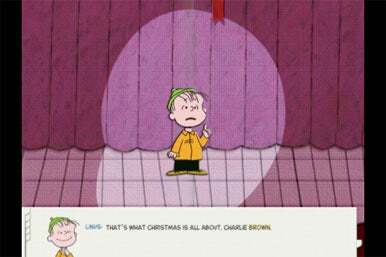 How much you enjoy A Charlie Brown Christmas for the iPhone and iPad, however, will probably hinge on which device you use to run the app and how you feel about its controls. Good Grief: A Charlie Brown Christmas faithfully recreates the 1965 TV special on your iPhone or iPad. The Charlie Brown Christmas app is a faithful book adaptation of the TV special, from Charlie Brown's seasonal angst to Snoopy's tree decorating contest to Linus's speech about the meaning of Christmas. The app incorporates the voices of the original cast, save for the narration, which is provided by Peter Robbins, who played the part of Charlie Brown in the 1965 special. Fans of Vince Guaraldi's memorable soundtrack for the TV special will be thrilled to hear snippets of "Christmas Time Is Here" and "Linus and Lucy" in the background. All of this plays out over gorgeously designed scenes that look like something out of a pop-up book. It's a really well-designed ebook. Of course, things would be pretty dull if A Charlie Brown Christmas were nothing more than a static book. Loud Crow works in a number of interactive elements. Touch the characters and they bobble about; in the rehearsal scene for the Christmas pageant, you can make them bop around to "Linus & Lucy," while an ice-skating sequence gives you the chance to make the Peanuts gang twirl around. Objects get in on the act, too—you can flick around Charlie Brown's director megaphone, tap falling snow to turn it into elaborate snowflakes, and even make the Christmas tree shed a few needles. It really draws the reader into the Charlie Brown Christmas experience. 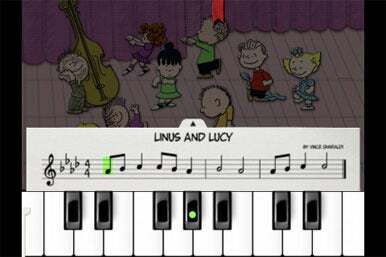 Piano, Man: The interactive elements in A Charlie Brown Christmas include the chance to play the opening notes of Linus & Lucy on an on-screen keyboard. There's another reason to fiddle with the objects on the screen—doing so unlocks ornaments, lights, and treetops that you can then use to decorate your very own Charlie Brown-style tree. That tree appears when you first launch the app, and, as with another great Loud Crow adaptation—The Going to Bed Book—the tree sways in the direction you tilt your iOS device. You can also purchase ornaments from an in-app store, though that seems an odd feature to include in an ebook app that decries how Christmas has become a big commercial racket run by an eastern syndicate. As engrossing an experience that Charlie Brown Christmas offers, the controls might yank some readers out of their reverie. The story's text appears on little strips at the bottom of the page; once you've completed the strip, you flick sideways to move onto the next segment. However, some strips don't give you an awful lot of room to work with, and you'll end up tapping a word inadvertently. This causes the narrator to read the word aloud—a great feature for helping young readers master particular words, but not so helpful if you're trying to simply flick to the next part of the story. Once you've worked your way through all the strips in a given scene, you've then got to tap the bottom of the screen to flip to the next page. It adds up to a lot of tapping, and some readers might find the process a little wearying. While a single download of A Charlie Brown Christmas will run on any iOS device, this app looks much better on an iPad. On the smaller screen of an iPhone or iPod touch, the story's text is considerably shrunken down, and the already problematic controls become a little harder to operate. It's a perfectly acceptable experience on the iPhone, but the iPad version really brings the story to life. Minor criticisms, aside, if the Charlie Brown Christmas special is a mainstay in your holiday celebration, Loud Crow's offering is a worthy adaptation for the iOS age. iPad owners, in particular, would be real blockheads if they overlooked this app.